February 9, 2017 Olympia, WA. 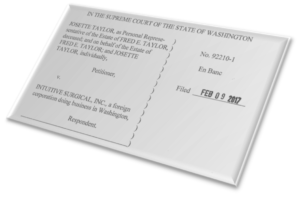 The Washington Supreme Court handed down its long awaited decision in Taylor v. Intuitive Surgical, Inc., finding in favor of Friedman Rubin’s client, Josette Taylor whose husband Fred died following botched surgery at Harrison Hospital in 2008. The lawsuit, which Friedman | Rubin co-counseled with attorney Carol Johnston of Bainbridge Island, focused on the “da Vinci” surgical robot made by Intuitive Surgical, Inc. Intuitive marketed its expensive robotic system to Harrison just like it did to other hospitals around the country. But Intuitive did not explain to Harrison that the learning curve for using the robot is extremely steep, requiring at least 20 surgeries for “basic competence.” Instead, Intuitive pushed Harrison to allow its surgeons to operate without supervision after only two supervised surgeries. Harrison followed their advice and permitted one of its surgeons, Scott Bildsten, to operate on Fred Taylor as his first unsupervised surgery using the da Vinci robot. Various complications developed during the robotic prostatectomy as Bildsten struggled to make progress using the robotic controls. Eventually, the surgery had be converted to open surgery and another surgeon called in to assist in making repairs. Fred suffered terribly following the botched surgery and he died four years later. Claims against Harrison and Dr. Bildsten were eventually settled, leaving the claim against the robot maker. The jury trial against Intuitive was widely covered by the media, including the NY Times, as it was the first of many “da Vinci” claims that were pending against the company to go to trial. The law in Washington, however, was not clear with respect to the liability of a manufacturers of medical devices. This eventually led to an erroneous trial outcome and an appeal. The Washington Supreme Court’s decision grants Josette Taylor a new trial and clarifies the law in ways that will benefit all patients. The Court held that manufacturers of medical devices have a duty to adequately warn hospitals about their inherently dangerous products and if they fail to do so they will be subject to strict liability for any harm to patients. Warning the hospital is important because only the hospital can make sure that adequately trained doctors are allowed to perform robotic surgeries. Doctors need to be given “credentials” from hospitals before they are allowed to perform robotic surgeries. If hospitals are not given adequate information about the learning curve, they can’t set their credentialing process in a way that protects patients. The Supreme Court’s opinion can be found here. FR acknowledges and thanks Ken Masters of the Masters Law Group for his outstanding work on the appeal.